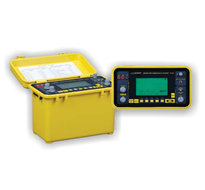 A Time Domain Reflectometer (TDR) has limitations of locating open and short circuit faults only. Low insulation faults are beyond the scope of such instruments. This calls for an instrument that can offer complete solution to the problems faced in the field. TFL B5 combines a TDR and an advanced bridge capable of locating any fault on telecommunication and pilot cables.